Mason jar coffee cake recipes are not only easy to make, they are easy to transport. 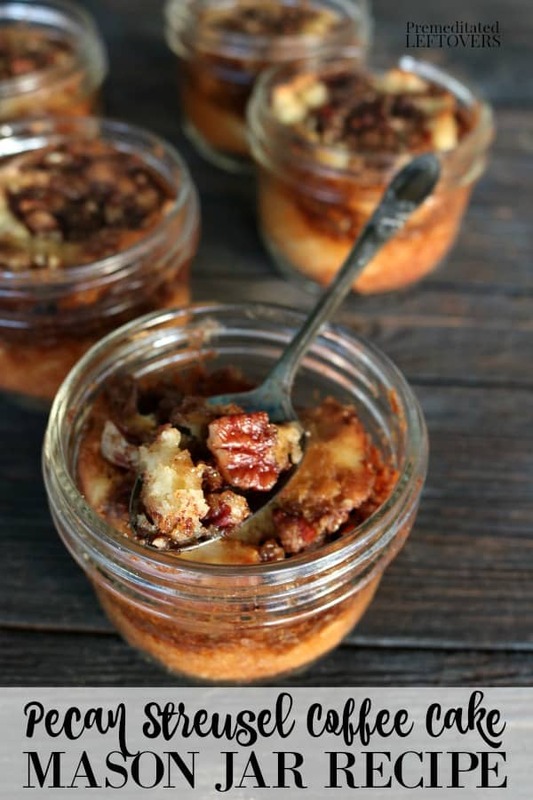 This mason jar pecan streusel coffee cake recipe is especially delicious! I love the swirl of streusel in coffee cake! I do not love getting up early to bake a coffee cake, so I can serve homemade coffee cake with brunch! I mean, isn't the point of a brunch eating late so you can sleep in? 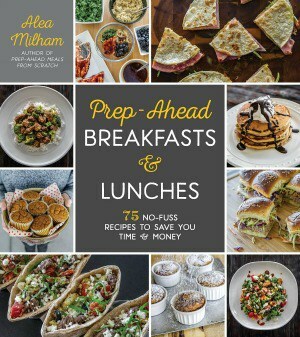 I have become a firm believer in make-ahead breakfast recipes because this tired mama needs her sleep! Mason jar coffee cake is the perfect make-ahead coffee cake recipe. 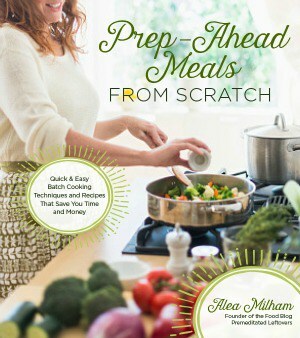 This make-ahead brunch idea is so easy to prep-ahead of time! Just bake the streusel coffee cake batter in wide-mouth 8-ounce mason jars, then once they have cooled, you put the lids on and store them until you are ready to serve your coffee cake. 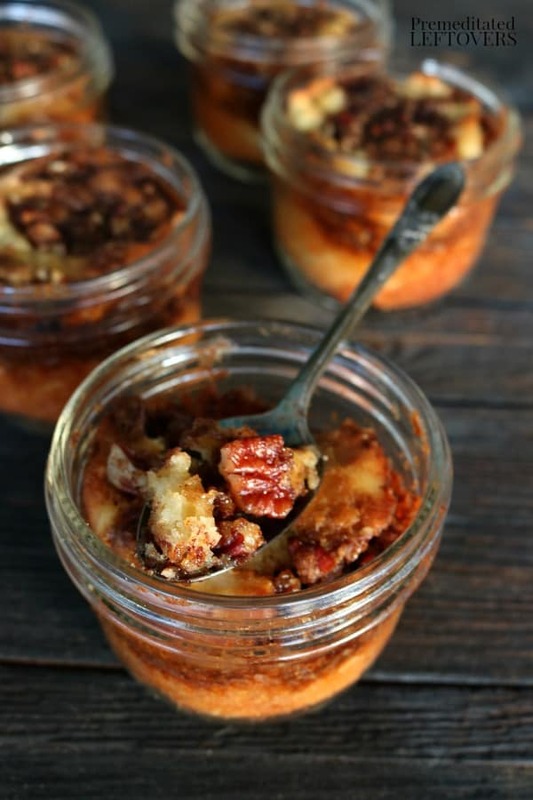 Serving the streusel coffee cake in jars also makes it easier to serve a crowd. You don't have to worry about slicing and plating coffee cake, so it makes your job as the hostess a little less stressful. This mason jar pecan streusel coffee cake recipe has a unique flavor provided by the brown sugar and spices in the pecan streusel. The spices in the streusel include cinnamon, ginger, and nutmeg. This pecan streusel coffee cake recipe has a moist crumb. The recipe uses plain yogurt, not sour cream to create the moist cake. If you like pecan coffee cake, you will love the unique twist of this pecan streusel coffee cake recipe! Butter or grease 12 wide-mouth 8-ounce mason jars. To make the streusel, combine the pecans, butter, brown sugar, and spices in a small bowl. To make the cake, whisk together the flour, baking powder, baking soda, and salt in a medium bowl. 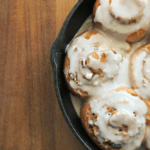 Beat the butter and sugar with an electric mixer on medium-high until light and fluffy, 2 – 3 minutes. Beat in the eggs, vanilla, yogurt, and milk scraping down the sides of the bowl as necessary. Reduce mixer speed to low and slowly add the flour mixture. Mix until thoroughly combined. Spoon half the batter into the mason jars and top with half the streusel; repeat. Place the jars on a baking sheet. Place on the center rack in the oven. Bake at 350 for 25 minutes or until an inserted toothpick comes out clean. Place jars on a wire rack to cool. Once the streusel coffee cake has come to room temperature, place a lid on each jar. You can store the mason jar coffee cakes on the counter for up to 3 days. You can store the individual coffee cakes in the refrigerator for a week. 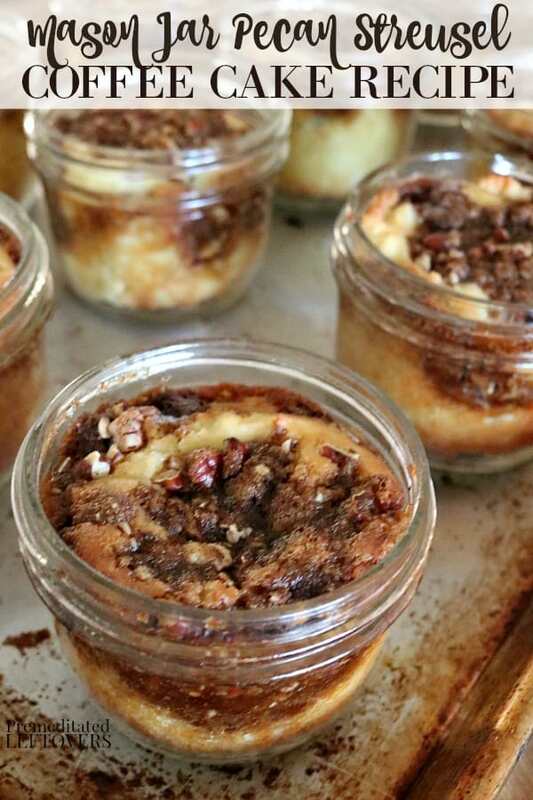 Yes, you can freeze these individual pecan coffee cakes in the mason jars. Wait until they have completely cooled. Then place the lid on the jars and seal. You can freeze the mason jar coffee cakes for up to 3 months. Beat the butter and sugar with an electric mixer on medium-high until light and fluffy, 2 - 3 minutes. Beat in the eggs, vanilla, yogurt, and milk scraping down the sides of the bowl as necessary. This is such a fun way to serve coffee cake! 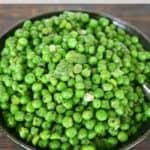 I love that they can be frozen for quick breakfasts later on. Such a great idea! What a clever idea! I’ve used mason jars for bringing panna cottas to a friend’s place for dinner, but it never occurred to me to use them for little portable cakes… totally perfect for a potluck or a picnic. Love the sounds of that spicy pecan streusel, too. So smart to use mason jars! 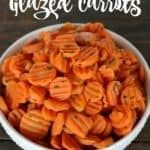 This recipe looks scrumptious! I Love the sounds of that spicy pecan streusel. 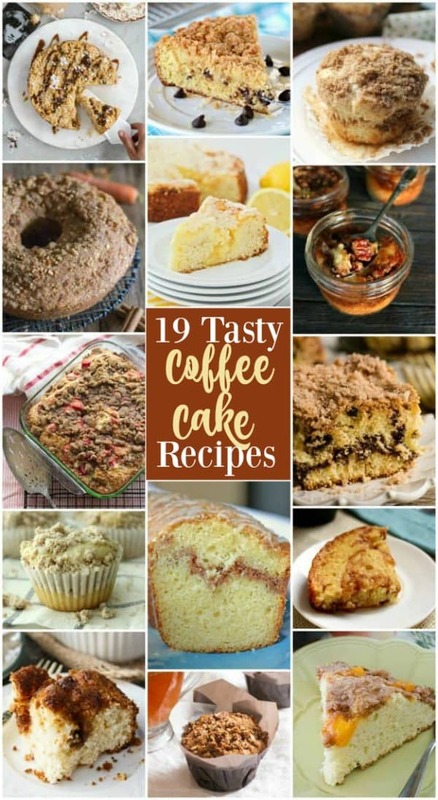 This is such a fun way to serve coffee cake! I love that they can be frozen for quick breakfasts later on. Such a great idea!